EsteeEatz | Food… Travel… Life… and more Food! Food… Travel… Life… and more Food! HAPPY CINCO DE MAYO!! Today was my first GAME OF THRONES Recap Show with Mike ‘the movie guy’ Pierce!! In today’s recap show – Mike and Estee discuss their favorite parts of last night’s episode “First of His Name.” They share a couple of clips and ask for answers from the fans. ”First of His Name” is the fifth episode of season 4 that aired Sunday, May 5, 2014 on HBO. Check out THE AMAZING SPIDER-MAN 2 New York Premiere which took place Thursday, April 24, 2013 at the Ziegfeld Theatre! Siempre supimos que la batalla más importante de Spider-Man era la que se desarrollaba en su interior: la constante lucha entre las obligaciones comunes y corrientes de Peter Parker y las extraordinarias responsabilidades de Spider-Man. Pero en The Amazing Spider-Man™ 2, Peter Parker descubrirá que un conflicto aún mayor lo espera en el futuro. Es maravilloso ser Spider-Man (Andrew Garfield). Para Peter Parker, nada se compara a colgarse y volar entre rascacielos, aceptar que se ha convertido en un héroe y compartir momentos con Gwen (Emma Stone). Pero ser Spider-Man tiene su precio: solo él puede proteger a los habitantes de Nueva York de los formidables villanos que amenazan a la ciudad. Con la aparición de Electro (Jamie Foxx), Peter deberá enfrentarse a un enemigo mucho más poderoso que él. Y con el regreso de su antiguo amigo, Harry Osborn (Dane DeHaan), Peter se da cuenta de que todos sus enemigos tienen algo en común: Oscorp. El director es Marc Webb. Los productores son Avi Arad y Matt Tolmach. El argumento y el guión son de Alex Kurtzman, Roberto Orci y Jeff Pinkner. Basada en el cómic de Marvel creado por Stan Lee y Steve Ditko. RIO 2 – In Theaters this FRIDAY! 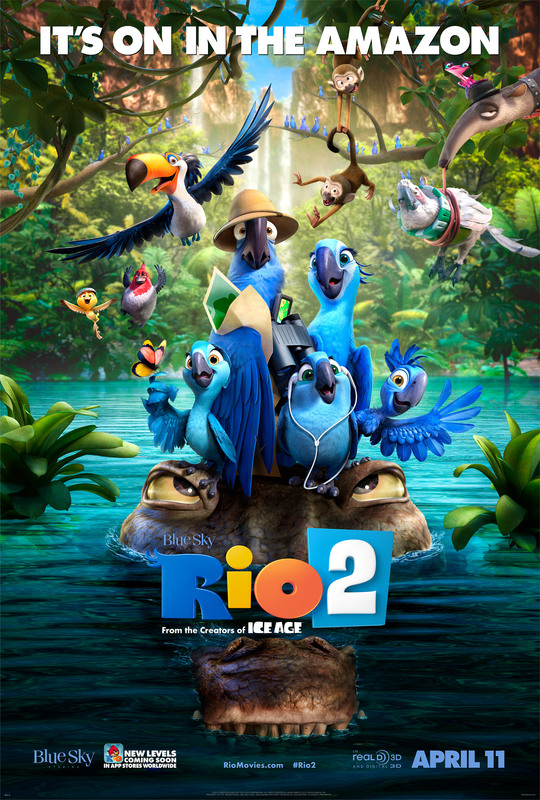 My son has been raving about going to watch the new upcoming movie Rio 2 coming to theaters this Friday, April 11th! With an all-star cast that includes Anne Hathaway, Jesse Eisenberg, will.i.am, Jemaine Clement, Tracy Morgan, George Lopez, Leslie Mann, Rodrigo Santoro, Jamie Foxx, Andy Garcia, Rita Moreno, Bruno Mars and Kristin Chenoweth. MUST SEE MOVIE THIS WEEKEND!! THE UNKNOWN KNOWN begins with an image of a seemingly infinite body of water. Why? The water is an expression of the unknown. You are looking out at this shimmering surface of the water, and wondering: What is underneath all that? That is the mystery I have investigated so many times in my films — what is going on in people’s heads? And what I usually find is self-deception, self-importance and self-satisfaction — phantasmagorical thinking. I spent 33 hours with Donald Rumsfeld. And what I discovered was that he was the quintessential Errol Morris character. Why did you want to interview Rumsfeld? Some might say he’s already had more than enough opportunities to tell his story. Many people are so angry at Rumsfeld that they haven’t even bothered to look at him. Maybe it’s too painful. Better just to reject him out of hand rather than to actually think about him. What got me started is that I read his autobiography, Known and Unknown — a brick of a book — in 2011, and discovered for the first time that he had written tens of thousands of memos — 20,000 during the Bush administration alone. I find these memos oddly fascinating. I don’t know exactly what they are. Are they merely instructions to his colleagues and associates? Are they genuine attempts to understand various policies, decisions or ideologies? Or were they written because Rumsfeld wanted to determine how he might be seen in the future — to create his own first draft of history? Or all of the above? The memos give us a way of looking inside of his head. I saw this as a chance to do history from the inside out, using the memos as a way of exploring the disjunction between how Rumsfeld wants to be seen, how he wants people to think of him, and who he really is and what he’s really done. The opportunity for him to read these memos, contextualize them, discuss them with me, was, to me, the most powerful reason for making the film. To say that I came into this movie without strong ideas about Rumsfeld and his policies would be fraudulent and disingenuous, at best. I was very much against the Iraq war, and I still am—I think it was a terrible mistake. But I believe I made this film in the spirit of inquiry, with a genuine desire to investigate, a desire to find out something that I might not have known before. 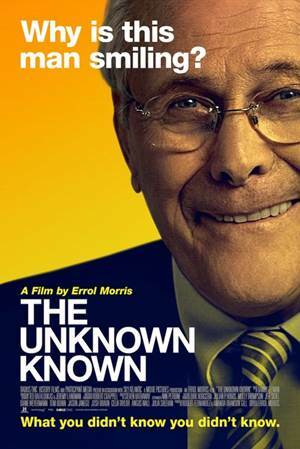 THE UNKNOWN KNOWN is taken from a famous statement Rumsfeld made during a 2002 press conference before the invasion of Iraq. Why did you choose this as your title? Rumsfeld is a person everybody knows, whose image was ubiquitous during the first few years of that administration. And yet, who is he? Who is this person, who we all know on some level? I see Rumsfeld as an unknown known. Few people realize that the words “Known knowns, known unknowns, and unknown unknowns, were in a memo titled “To Discuss with P.” dated May 21, 2001 — months before September 11th. Also included in that memo is the phrase “the absence of evidence isn’t evidence of absence.” When Rumsfeld famously trotted out the “knowns” and the “unknowns” on February 12, 2002, it was in response to a question from Jim Miklaszewski of NBC News about the link between Saddam Hussein and terrorist groups. Instead of answering Miklaszewski’s question, he deflected it into a kind of philosophical evasion: You see, there are the things that we know about, the things we don’t know about, and the things we don’t realize we don’t know about. And then another reporter interrupts and says, “But he didn’t ask you something that was unknowable. He asked you if you knew of evidence that Iraq was supplying, or willing to supply, weapons of mass destruction to terrorists.” In other words, we don’t want to hear a discussion of the nature of evidence — we’re going to war! To me, one of the most remarkable things in the movie is that as the Iraq war is clearly going south — rather than ever admit it, Rumsfeld talks more and more about the meaning of words, about semantics, about this dictionary versus that dictionary, this definition versus that definition. I like to think that George Orwell would have looked kindly on this effort. A mathematician friend of mine saw a cut of the film at MIT, and said, “Are you aware that he constantly is uttering contradictions?” And I said, “Yes, the thought has occurred to me.” Then she also pointed out to me something that I also was aware of, that is absolutely true — in logic, from a contradiction, you can prove anything. I was very scared by that line. Are you supposed to just imagine anything? And act on it? He takes these words from an introduction written by Thomas Schelling for Roberta Wohlstetter’s book Pearl Harbor: Warning and Decision, about the intelligence failures that led to Pearl Harbor. But those words aren’t in Schelling’s introduction. And what do you get? The war in Iraq. You don’t need oil, desire for world hegemony, Islamofascism, as reasons to go to war. All you need is a kind of crazy thinking. You imagine the worst and treat it as if it’s really going to happen. He says: “I wish we could see around corners.” Well, to see around corners, you have to look. Sometimes when Rumsfeld tells stories about other people, it seems like he’s talking about himself. And he doesn’t seem to be aware of it. It’s because we all have an infinite capacity for denial. We always try to avoid looking at ourselves. Isn’t it what makes life possible? Do you think you were hard enough on him? Would he have told you more if you pushed him more? Did I at any point ever say to him: “I think what you did was deeply wrong, and against international law”? No, I did not. And I can defend the decision not to do that on a number of levels. If the goal is to terminate the interview quickly or to create the frisson of a clash where the interview subject gets up and walks out of the room in a huff — that would be easy to achieve at any point. That was not my intent. I wanted to learn something from the interviews — not just provide the expected, dramatic confrontation. I came to realize that he was answering my questions, in his own way. He was telling me a very powerful story about himself and how he sees the world, and that it was all there. Now, there is a naïve notion about investigative journalism: that we’re going to be given the key to a lock box and we’re going to be allowed to listen to the deepest, the darkest secrets of history. And often the most frightening thing is that we open the lock box and it is empty. What’s the connection between THE UNKNOWN KNOWN and your previous film THE FOG OF WAR? Between Robert McNamara and the Vietnam War and Donald Rumsfeld and Iraq? THE FOG OF WAR raises the question: “Is McNamara really sorry? And does being sorry make a whit of difference when we’re talking about the deaths of millions of people?” There is no such doubt about Rumsfeld. He’s unapologetic. He would like us to think that the Bush administration did the best they could in a stressful moment in our history. But more than that, he doesn’t want to show weakness, or to second-guess himself. The movie I have made with Rumsfeld is vastly different from THE FOG OF WAR. It is a character study of a very different kind of character: it is about a mind that appears to be open but may in fact be locked up like a safe. My wife, Julia, likens Robert McNamara to the Flying Dutchman, traveling the world looking for redemption that he’ll never find. And she sees Rumsfeld as the Cheshire Cat — all that’s left at the end is the smile. 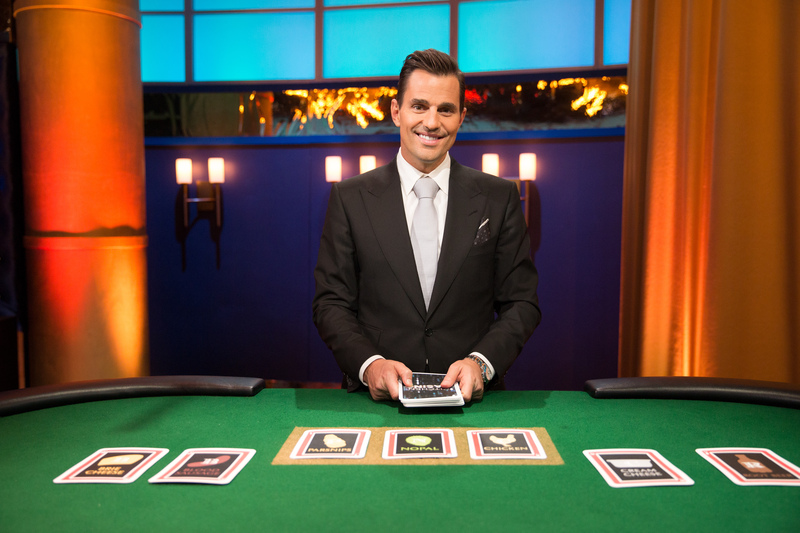 Food Network’s new competition series Kitchen Casino hosted by Bill Rancic and premiering on Monday, April 7th at 9pm ET/PT brings together four talented chefs in a high-stakes game of chance that requires skill, speed and adaptability. 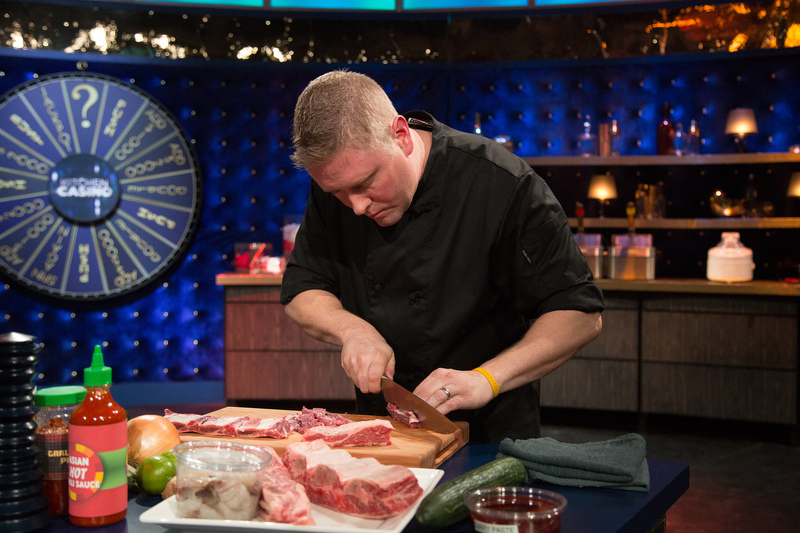 In each episode, four competitors would be wise to keep one eye on the ticking clock while they attempt to out-cook and out-smart their competition during three casino-themed cooking challenges – slots, poker and roulette – for a chance to win the $30,000 jackpot. The chefs must be at the top of their game throughout the three rounds to handle whatever Lady Luck deals them, and they must double-down on their skills or risk being 86’d. Each episode features a panel of rotating judges including Michael Chernow, Madison Cowan, Danyelle Freedman, Gavin Kaysen, Aliya Leekong and Kristin Sollenne. When I first met my husband, he invited me to his yearly family reunion. His mother has a very LARGE family with 3 girls and 5 boys. Each one of them usually brings a desert to the gathering and I was immediately addicted to these cookies his aunt makes every year. These cookies are AMAZING and have all of my favorite flavors of chocolate, cookie dough and nuts. I literally walk by the desert table 50 times grabbing one of these cookies because they are so addicting. I promise when you make these, everyone will LOVE them! Blend butter and sugar in a bowl. Stir in egg yolks and vanilla. Sift flour and salt into bowl; mix well. Chill 1 hour. Roll into 1-inch balls. Dip into slightly beaten egg whites. Roll in chopped nuts. Place 1-inch apart on cookie sheet. Bake at 350 F for 7 minutes. Press thumb into center of each. Bake 5 to 7 minutes longer or until done. Then let cool. 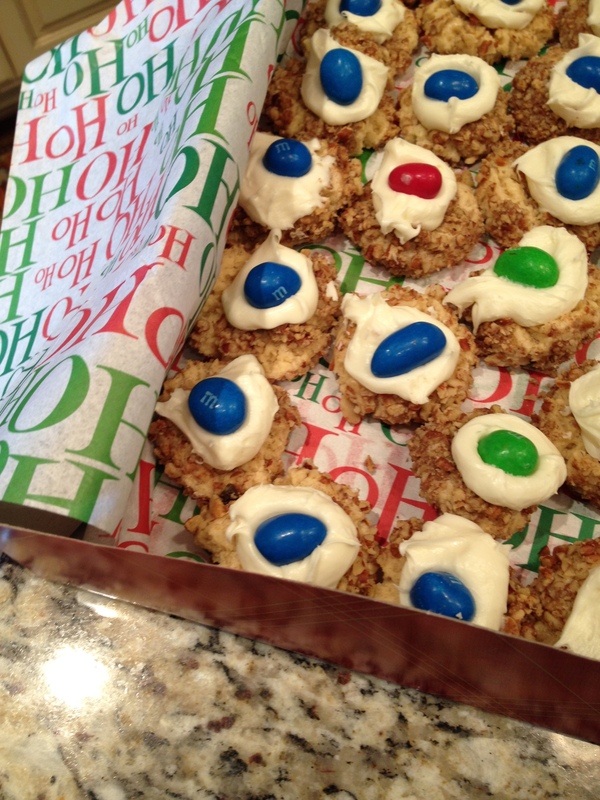 Fill with frosting and top with M&M candies. 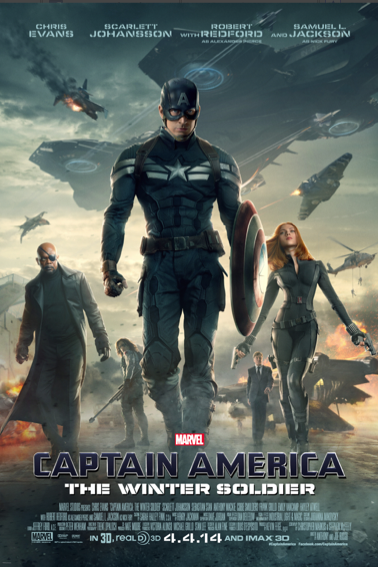 This Friday, April 4, the first avenger returns to the big screen in CAPTAIN AMERICA: THE WINTER SOLDIER. CAPTAIN AMERICA: THE WINTER SOLDIER is what remains after the events in the AVENGERS, focusing on the life of Steve Rogers aka Captain America (Chris Evans) is adjusting to the modern world. Accompanied by the biggest names in Hollywood, this latest installation returns with the favorites of Marvel: Black Widow (Scarlett Johansson), Nick Fury (Samuel L. Jackson), and also new is Anthony Mackie playing Falcon, and the iconic Robert Redford as Alexander Pierce!